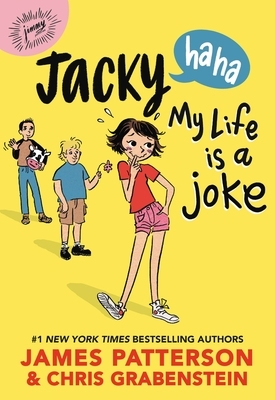 James Patterson's newest hilarious heroine returns in Jacky Ha-Ha: My Life Is a Joke, the sequel to the smash hit Jacky Ha-Ha---a #1 New York Times bestseller! Jacky Hart has found a hidden talent in the performing arts, and she's a triple threat onstage! She wants nothing more than to act and sing all summer--but her parents have other plans for her. Jacky reluctantly signs up for a summer job in her resort town of Seaside Heights, New Jersey, where tourists come to enjoy the beach and fun carnival atmosphere. Now she has serious responsibilities like her job and babysitting her younger sisters, but Jacky longs to perform in the summer stock performance of A Midsummer Night's Dream. Can she handle all of her important commitments and still have fun with her friends--or will she learn that juggling isn't one of her many talents? James Patterson's middle grade jokester Jacky returns in this wild romp through summer in the Jersey Shore, featuring lively illustrations by French artist duo Kerascoët. James Patterson received the Literarian Award for Outstanding Service to the American Literary Community from the National Book Foundation. He holds the Guinness World Record for the most #1 New York Times bestsellers, including Middle School, I Funny, and Jacky Ha-Ha, and his books have sold more than 375 million copies worldwide. A tireless champion of the power of books and reading, Patterson created a children's book imprint, JIMMY Patterson, whose mission is simple: "We want every kid who finishes a JIMMY Book to say, 'PLEASE GIVE ME ANOTHER BOOK.'" He has donated more than one million books to students and soldiers and funds over four hundred Teacher Education Scholarships at twenty-four colleges and universities. He has also donated millions of dollars to independent bookstores and school libraries. Patterson invests proceeds from the sales of JIMMY Patterson Books in pro-reading initiatives. A Parents' Choice Award Winner! A National Parenting Products Award Winner! "Readers will find Jacky entertaining....the art is playful and fun. This title is sure to have high circulation among fans of Patterson's previous works." "The story is stuffed with page-turning pranks, and the swoopy b&w cartoons from Kerascoët only add to Jacky's untamed energy....The novel is sure to amuse and encourage readers who don't have it all figured out just yet." "James Patterson has figured out the formula for writing entertaining books for tween readers. Jacky is a wildly engaging character. [The story is] great fun."